In addition to being able to display TUAs from third-party TMA implementations, Debrief can be used to derive fresh TMA solutions. These solutions are not presented in the form of TUAs, but in the form of analysis legs: a time-limited track segments comprising a series of points at constant course and speed. Traditionally these segments are created by analysis of a combination of sonar-derived bearings and frequencies. These TMA segments are represented as track segments within Debrief for which the course and speed of the whole track (solution) are editable via the Properties Window. The workflow for creating and manipulating TMA segments is covered in the Single Sided Reconstruction in Debrief tutorial in the Debrief online help. Debrief allows you to generate a segment of track data from a block of sensor data - replicating the process conducted on warships. This track segment adjusts dynamically to reflect the sensor location changing (such as if the sensor offset is edited - see Section 11.1.4, “Sensor offset lengths editor”). In the absence of sensor data it is possible to generate a segment of target track from a set of ownship positions. Data to support these operations is collected via a wizard, as described in the above tutorial. Once TMA segments are present on the Debrief plot they are manipulated using the Drag Track Segment toolbar button . Once this button is pressed Debrief automatically displays the Bearing Residuals view, which displays bearing residual data - subject to the constraints listed earlier in Figure 3.2, “Stacked Dots view” (with the TMA Segment present as the secondary track). If your data contains frequency data then you can open the Frequency Residuals view, which display actual, and calculated frequencies (based on the selected solution). Read more about the frequency algorithms in Section 19.3.1, “Frequency algorithms”. Drag one end of the track, maintaining the target course but changing the track length (target speed). When the centre-point of the track is dragged, the track moves in and out stretching/contracting as necessary to adhere to the start/end points on the host platform bearing fan. Note, only the Translate and Rotate operations are available for all track sections. Only the Stretch and Shear operations are suitable for application to straight-line TMA Segments Thus, the hand cursor will only turn green over straight-line TMA Segment hot spots. When in Translate or Rotate mode, the drag-highlight is extended beyond the first/last point in the track to assist with alignment. A target-circle is also plotted on this extended stalk. This target is plotted at a distance equal to the distance back to the end-but-one point. 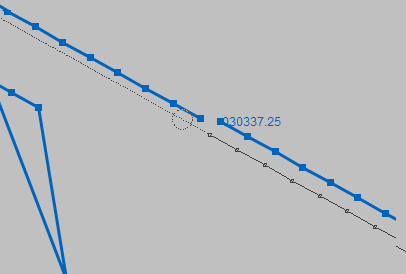 Thus, if you have equi-spaced track data this target can be used to align the track sections longitudinally and transversely. In the following diagram the lower-right track segment is being dragged inline with the upper-left track segment. Place the circle/cross hair over the end point of the fixed track to align the tracks in both dimensions. Note, when the plot is in one of these modes, the operations apply to the ends of the track - so the operation is started by dragging one end of the track (once the 'selected' hover highlight is shown). In addition to the specific operations performed at the ends of the target track, all modes support picking up and dragging the track when it is picked up at its centre In the Stretch mode the track shifts as described above, in all the other modes it is translated. Collectively, TMA segments are combined into target tracks using the Group and Merge operations described in Section 3.7, “Grooming track data”.